Rezaei, Z., Khabnadideh, S., Afiatjou, E. (2005). In-Vitro Study of Dipyridamole–Propranolol Interaction in Protein Binding in the Absence and Presence of Nicotine. Iranian Journal of Pharmaceutical Sciences, 1(3), 171-176. Zahra Rezaei; Soghra Khabnadideh; Elham Afiatjou. "In-Vitro Study of Dipyridamole–Propranolol Interaction in Protein Binding in the Absence and Presence of Nicotine". 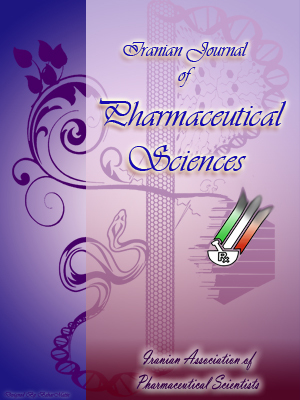 Iranian Journal of Pharmaceutical Sciences, 1, 3, 2005, 171-176. Rezaei, Z., Khabnadideh, S., Afiatjou, E. (2005). 'In-Vitro Study of Dipyridamole–Propranolol Interaction in Protein Binding in the Absence and Presence of Nicotine', Iranian Journal of Pharmaceutical Sciences, 1(3), pp. 171-176. Rezaei, Z., Khabnadideh, S., Afiatjou, E. In-Vitro Study of Dipyridamole–Propranolol Interaction in Protein Binding in the Absence and Presence of Nicotine. Iranian Journal of Pharmaceutical Sciences, 2005; 1(3): 171-176. The binding of drugs by plasma proteins is an important phenomenon, because it influences the size of the free fraction of the drugs in plasma. In this study the influence of dipyridamole (DP) on the protein binding of propranolol (PL) and PL on the protein binding of DP were studied alone and in the presence of nicotine (NC). The equilibrium dialysis was employed for protein binding studies. Results showed that DP (10 μg/ml) increased the protein binding of PL (1-40 μg/ml) by 4.1%, and PL(30 μg/ml) decreased the protein binding of DP (1-30 μg/ml) by 3.7%. NC (2 μg/ml) did not have any influence on the protein binding of PL and DP. Therefore, coadministration of PL and DP may cause an alteration in their pharmacological effects, but cigarette smoking possibly does not change protein binding of PL and DP. The binding of drugs to plasma and tissue proteins is an important factor affecting the drugs, distribution and rate of metabolism. Pharmacological effect is closely related to the free concentration of drug at its site of action. There are examples of many drug-drug interactions which have been reported to present displacement of the bound drug by a second therapeutic agent. The acidic drugs commonly bind to plasma albumin and concomitantly administered drugs may displace each other from their binding site. The basic drugs may bind to either albumin or a acid glycoprotein (AGP). Propranolol (PL) is the most widely used adrenergic b-receptor blocking agent thatbinds to plasma proteins by 90%-95%. Evans reported that PL mainly binds to albumin ,but Sager et al. reported that PL binds mainly to a-acid glycoprotein . Certainly, PL binds to albumin and a-acid glycoprotein . It has been reported that binding of PL to albumin or a-acid glycoprotein is related to the species of animals . Serum binding of some basic drugs such as PL is increased with inflammation or stress, and it is accepted that this is due to an increase of the plasma proteins . The absorption, protein binding and metabolism of PL may all be affected by the co-administration of other drugs . It has been reported that PL can displace acetylsalisylic acid from its binding sites . Dipyridamole (DP) is commonly used as a coronary vasodilator and antiplatelet drug that binds to plasma protein by 99% . AGP and albumin are responsible for the high protein binding of DP in plasma . It has been reported that DP and its analogues enhance the in vitro activity of antimetabolite anticancer drugs with reduced AGP binding; therefore,nucleoside transport inhibition can be maintained in the absence of AGPbinding . Cigarette smoking can affect drug therapy by both pharmacokinetic and pharmacodynamic mechanisms by polyaromatic hydrocarbons and nicotine . It has been reported that smoking displaces lidocaine from protein binding sites . It has also been reported that cigarette smoking results in faster clearance of heparin, possibly related to smoking-related activation of thrombosis with enhanced heparin binding to antithrombin III . The protein binding of DP and PL which have high protein binding capacities may be altered in smoking which could be of clinical importance; therefore, in the present study, we investigated the displacement of PL and DP from protein binding sites by each other and in the absence and presence of nicotine (NC). Dipyridamole was obtained from Bohringer; propranolol was obtained from Sigma; and nicotine was purchased from Merck. Normal human pooled plasma was obtained from the Shiraz Blood Bank. In vitro protein binding of the drugs was measured by equilibrium dialysis. Dialysis was performed in duplicate at 25 °C for 10 h in Perspex half-cell separated by a cellophane membrane. One compartment contained phosphate buffer (1.2 ml; pH 7.4; ionic strength 0.17) in which the drug was dissolved, and the other contained plasma(1.2 ml). The concentrations of the drugs was determined by spectrophotometric method[12, 13]. In order to determine PL concentration, 1 ml NaOH 0.1 N was added to 3 ml of the sample, and the resulted solution was extracted using 20 ml heptane containing 1% v/v methanol, shaked for 5 min, and after that centrifuged at 3000 rpm for 10 min. The organic phase was separated from the aqueous phase, and the solvent was evaporated under a stream of nitrogen gas. The residue was dissolved in 2 ml HCl 0.1 N and PL was extracted as hydrochloride salt. After adjusting the pH to 7.4, the absorbance was measured at 289 nm. For determination of DP concentration, 1ml NaOH 1 N was added to 0.5 ml of the sample, and the resulted solution was extracted using 4 ml n-hexane/isoamyl alcohol (with the ratio of 75/25), shaked for 5 min, and then was centrifuged at 3000 rpm for 15 min. The organic phase was separated, and the solvent was evaporated. The residue was dissolved in phosphate buffer, pH 7.4, and its absorbance was measured at 413 nm. The binding data for plasma proteins was analyzed and the molar concentration of the unbound (Cu) and the bound drugs (Cb) were determined for DP and PL. Figure 1. The binding of propranolol (1-40 μg/ml) to plasma proteins in the presence of dipyridamole (10 μg/ml) and nicotine (2 μg/ml). As drug-plasma protein binding is usually studied over concentration ranges which are representative of the therapeutic drug levels, therefore, concentrations similar to the usual plasma level of the drugs (or higher) were chosen in our experiments. We obtained the binding parameters of PL to the plasma proteins at the concentrations between 1-40 µg/ml, in the presence of DP (10µg/ml). Displacement of PL from protein binding sites by DP, was also measured in the presence of nicotine (2 µg/ml). In the second step, binding parameters of DP at the concentrations between 1-30 µg/ml were obtained in the presence of PL (30 µg/ml), and also PL (30 µg/ml) + NC (2 µg/ml) to plasma proteins. Table 1. Effect of dipyridamole on the protein binding of propranolol in the presence and absence of nicotine. PL: propranolol; DP: dipyridamole; NC: nicotine. The binding of PL (1-40 ìg/ml) to plasma proteins and its interaction with DP (10 ìg/ml) was analyzed with Scatchard plots. DP altered the protein binding of PL to plasma proteins by 4.1%, but this was not associated with any significant alteration in the number of binding sites (Figure 1). As shown in Table 1, DP (10 µg/ml) could significantly increase Cu of PL (1-20 µg/ml), but NC (2 µg/ml) had no effect on the protein binding of PL in the presence of DP. The protein binding of DP (1-30 µg/ml) to plasma proteins was also analyzed in the absence and presence of PL (30 µg/ml) and NC (2 µg/ml). The results show that DP displaced PL from plasma protein binding sites. The decrease in the binding of DP to plasma proteins with 30 µg/ml of PL was only around 3.7% at the above mentioned concentration of DP (Figure 2). Table 2 shows the effect of PL (30 µg/ml) on the Cu of DP (1-20 µg/ml) in the absence and presence of NC (2 µg/ml). PL could significantly increase Cu of DP but NC did not alter this displacement. Table 2. Effect of prpranolol on the protein binding of dipyridamole in the presence and absence of nicotine. The clinical importance of the plasma protein binding of drugs has been indicated in several reports that attribute the exaggerated effects of certain drugs and endogenous hormones to their inadvertent displacement from binding to plasma proteins by the administration of other agents [6, 14]. This kind of interaction leads to an alteration in the free levels of the pharmacologically active component of the drug and influences both the therapeutic and toxic effects of the agent. to 95%, it will thereby increase the concentration of the free and active form of the drug from 1% to 4% (a four-fold increase). However, it has been reported that NC can alter the protein binding of drugs , but we found that NC with a concentration of 2 µg/ml did not have a significant effect on these interactions. Therefore, cigarette smoking possibly does not change the protein binding of PL and DP. This research was financially supported by a grant from Shiraz University of Medical Sciences. Evans GH, Nies SA, Shand DG. Plasma binding of propranolol. J Pharmacol Exp Ther 1973; 186:114-22. Sager G, Odd G, Jacobsen N, Jacobsen S. Variable binding of propranolol in human serum. Biochem Pharmacol 1979; 28: 905-11. Krishnia R, William GT, Richard E M. Assay of total and free propranolol in plasma by liquid chromatography with flourometric detection. Clin Chem 1985; 31: 131-4. Frans M, Bel P, Rene A, Breackman G, Marc GB. Binding of oxprenolol and propranolol to serum albumin and α-acidglycoprotein in man and other species. Biochem Pharmacol 1984; 33:2065-9. Wood AJ, Feely J. Pharmacokinetic drug interaction with propranolol. Clin Pharmacol1983; 8: 253-62. Uma T, Manju B, Sen P, Mahjan P. In vitro interaction between aspirin and propranolol at the plasma protein binding sites. Indian J Med Res1987; 86: 95-100. Curtin NJ, Newel DR, Harris AL. Modulation of dipyridamole action by α-acid glycoprotein. Biochem Pharmacol 1989; 38: 3281-8. Macgregor TR, Sardi ED. In vitro protein binding behavior of dipyridamole. J Pharm Sci 1991; 80:119-20. Curtin NJ, Bowman KJ, Turner RN, Huang B, Loughlin PJ, Calvert AH, Golding BT, Griffin RJ, Newell DR. Potentiation of the cytotoxicity of thymidylate synthase (TS) inhibitors by dipyridamole analogues with reduced alpha1- acid glycoprotein binding. British J Cancer 1999;80: 1738-46. Zevin S, Benowitz NL. Drug interactions with tobacco smoking. An update. Clin Pharmacokinet 1999; 36: 425-38. Shand DG, Nuckolls EM, Oates JA. Plasma propranolol levels in adults with observation in four children. Clin Pharmacol Ther 1970; 11:112-20. Steyn JM. HPLC determination of dipyridamole in human serum. J Chromat 1979; 60: 934-43. Amitava D, Timothy GT. In vitro displacement of phenytoin from protein binding by nonsteroidal antiinflamatory drugs tolmetin, ibuprofen and naproxen in normal and uremic sera . Ther Drug Monit 1996; 18: 97-9.